The Danish visual artist Nicolai Howalt is currently showing the exhibition Light Break at Medicinsk Museion in Copenhagen from 10 April to 10 July 2014. Light Break takes its point of departure in the medical phototherapy that the doctor and Nobel laureate Niels Ryberg Finsen practised at the end of the nineteenth century. 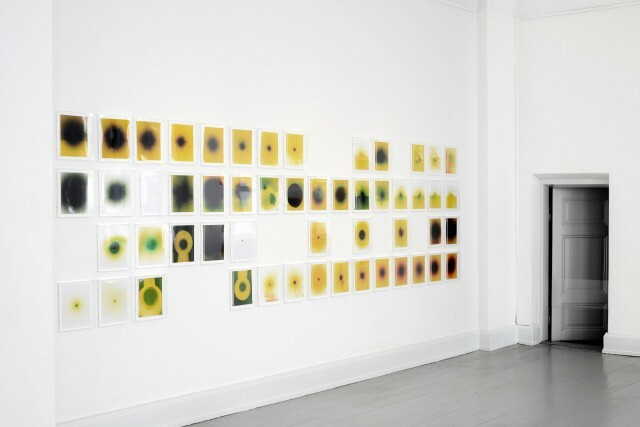 This part of medical history has led the visual artist Nicolai Howalt into a field of work where sunbeams are the central concern. In photographic one-off works he investigates and visualizes the visible and invisible part of the light spectrum, the power of the sun and its life-giving as well as its destructive radiation. Light Break is a documentary and aesthetic encounter between photography, science and visual art. The exhibition reflects Nicolai Howalt's fundamental and photographic interest in light as material. In his investigations Howalt uses the scientific methods and apparatuses of the nineteenth century. For example he has borrowed a number of Finsen's lenses from Medicinsk Museion. Inspired by Finsen's method and with the aid of coloured filters, Howalt absorbs parts of the rays of the sun and lets the remaining selected area of the electromagnetic spectrum pass through original rock crystal lenses. The beams of light are thus captured on photosensitive paper (C-print) and the resulting photograms thus become unique, untreated impressions of some of the rays of the sun. An almost subjectless universe of the sun and light itself takes form in the large number of images in the exhibition. Nicolai Howalt (b. 1970) is an internationally recognized visual artist who works primarily with photography. His practice has its starting point in the world of reality. With a conceptual and abstract approach in the works, Howalt investigates and explores a variety of often-existential themes, and at the same time challenges the boundaries of the photographic medium. Despite the diversity of themes in Howalt's works they always retain a sense of duality - the abstract and the real, life and death, horror and fascination, the finite and the infinite. Nicolai Howalt has received a number of grants and honours, including the Niels Wessel Bagge Honorary Grant and grants from the National Arts Foundation, the Ny Carlsberg Foundation and the Hasselblad Foundation. Howalt's works are richly represented in public collections such as The Israel Museum, Jerusalem; MUSAC, Spain; Maison Européenne de la Photographie, France; The Museum of Fine Arts Houston, USA; the Ny Carlsberg Foundation; the Danish National Arts Foundation; the Esbjerg Museum of Art and the Skagen Museum. Nicolai Howalt has had books published by the publishing houses Gyldendal, Hassla Books, Études Books and Hatje Cantz. Nicolai Howalt is represented by the Martin Asbæk Gallery, Copenhagen, Edel Assanti, London and the Bruce Silverstein Gallery, New York. Opening: 10 April, 17:00 - 19:00.